It was great to meet with a couple of fellow roleplayers, thanks to those who came along! I will set a date here for the next meetup, say next weekend Sunday 20th 8:30pm server time? MarkusNemesis wrote: How is it restrictive? * No ability to carry out assassination / bounty attempts. * Decreased risk vs reward of entering enemy territory. * Lack of risk of spontaneous pvp decreases potential story arcs. My thing is that PvP uses game-systems to battle, not role-play. What level you are, what class you are, what gear you have can all be completely exclusive from who your character is. My character might be a thief who doesn't go out and do battle in the world, but I go out and kill things OOC'ly. Or maybe I have a level 60 in raiding gear, but I RP as a beginning adventurer. Not to mention just smacking things isn't roleplay in my opinion. There's no story there. I Beilive that's why when people wanted to RP they had special PvE server to RP with RP rules. 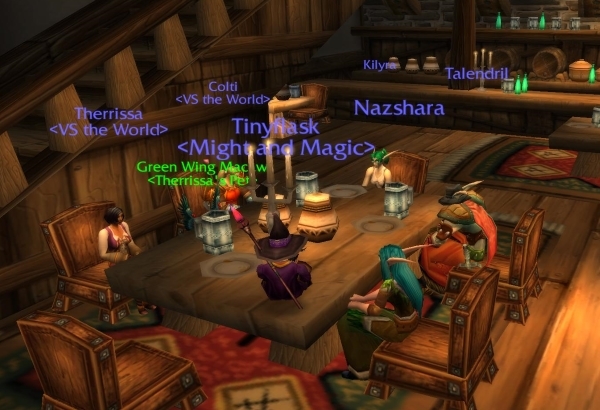 Later due to much outcry blizzard made RP-PvP but it still to this day very limited amount of servers. Being a vanilla server I lived moving from PVP to OvE and love how more of the RP community came too. I know people complain "I never see anyone!" Know that we not active 24/7, but we do meet up and hang out!! I am a brand new player to Nostalrius (in fact I joined the server yesterday after a few years off WoW duty) and I was very excited to learn about this little event. My understanding is that JCarrill0 has been having issues accessing his account, but the event went on flawlessly. Thank you to all the participants, and hope to see you again soon! Click the image below to see a few screenshots from the event, and click this link to check a Steam group that has been created for Nostalrius Roleplayers. Although I believe the most important communication tool is the chat channel. Type in /join rp next time you log in, there are some interesting RP (and non-RP) discussions voer there. See you all around soon! Me! Me! I see me! Great meet up! Really happy to see the RP community on the PvE realm growing again. If you're interested in joining us or have questions about RP in general, feel free to join /rp in-game and say hello. Hey guys I'm really pleased to see the event went ahead! What a great turnout by the looks of it! I'm sorry I wasn't able to log on and be there due to work & irl stuff taking over. Did you plan the next date between yourselves for the next meet up? Not yet, but if no one has any objections, I think Sunday would be good for another meet up. We're always talking in /rp in-game, so feel free to come on and let us know what works best for you.